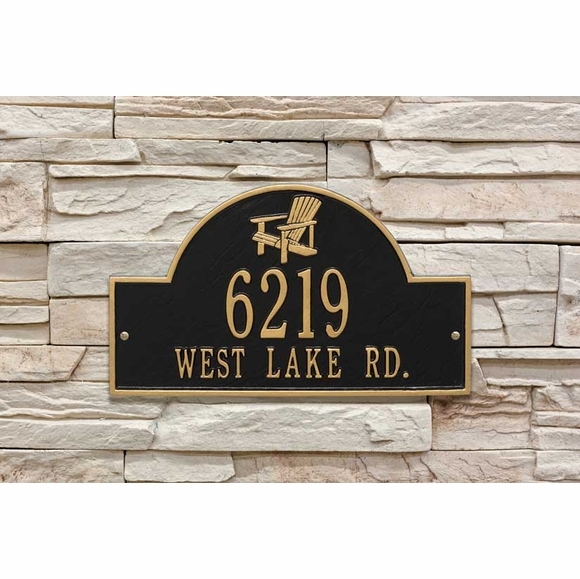 Adirondack Chair Address Plaque - - coastal style address sign. Custom made with the two line address your supply and Adirondack chair accent inside the arch. Made in USA. Character count includes spaces, apostrophes, and other punctuation. Large image color is black/gold. Smaller images (from left to right) are antique brass, antique copper, black/gold, white/bold, oil rubbed bronze, bronze/gold, and pewter/silver, green/gold, red/gold, black/silver, black/white. Manufactured from cast, high-density aluminum alloy and protected by Alumi-Shield™ all weather coating. Dimensions: 15.75" x 9.25" x .375"; weighs 3 pounds. Adirondack Chair Address Plaque encourages relaxation. Custom made with a two line address and Adirondack chair accent. Custom made in USA.